I am a watercolour artist, passionate about colour. I have been painting professionally for over 35 years and love to share my discoveries. You can see more of my work along with tutorials on my website www.janeblundellart.com. You can also find me on Facebook at Jane Blundell Artist, and on Instagram as Janeblundellart. They make a range of products for the home as well. I bought this intriguing set a number of years ago as it looked like a very portable way to carry a number of watercolour pencils. I put the leads into an old cigar package. What I particularly liked was that the pigment information was given - very rare - and the lightfast ratings are excellent. They re-wet well and can easily be used to paint with. 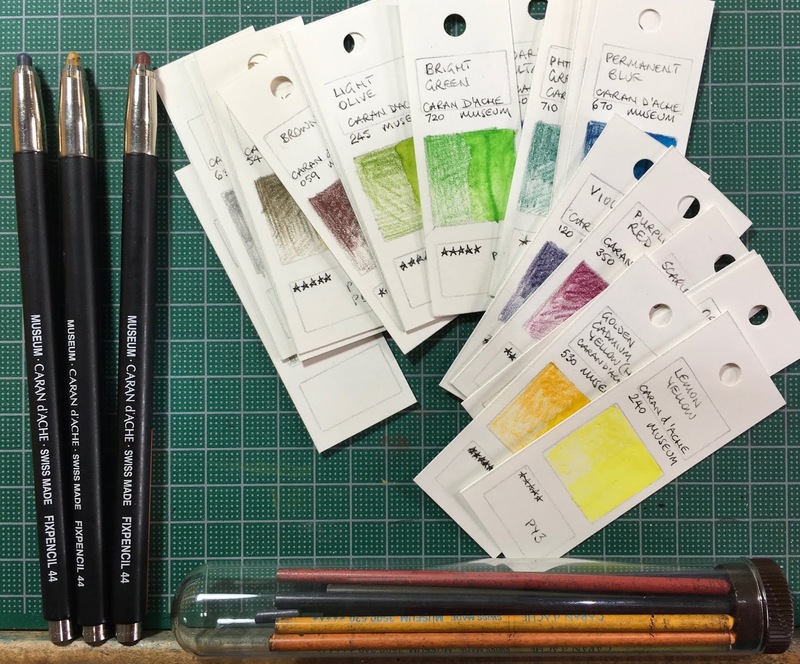 While I believe this set has been discontinued, the new range of traditional wooden watercolour pencils (see here) are probably made using similar pigments though the range of colours is now 80. I haven't tested the new range but they look gorgeous! Light Cadmium Red (Hue), Scarlet. Caran d'Ache Museum Watercolour Pencils - Genuine Umber, Payne's Grey, Black, B graphite, 3B Graphite. The certainly are a cool way to use watercolor! Just 6 Colours - a lovely limited palette. Watercolour Comparisons 1 Ultramarine Blue PB29. All rights reserved. Jane Blundell.. Watermark theme. Powered by Blogger.